Tim Pinto has worked in education throughout his career with management roles in secondary schools and also positions in further and higher education. Over the past five years he has worked in the area of online safety as E-Safety Manager for Yorkshire Humber Grid For Learning and Rotherham Local Safeguarding Children’s Board. 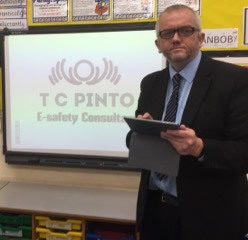 In these roles, Tim worked extensively with schools in the Yorkshire region, supporting them with e-safety and developing guidance documents and policies. He has also worked on a national level speaking at conferences organised by NSPCC and Optimus. Tim is a member of the Educational Advisory Board for CEOP (Childrens Exploitation and Online Protection Centre) and has worked with a number of different bodies training staff and developing resources. He is now a freelance consultant working with schools and other organisations around the country.